Location: East of B4386 to the south of the B4368 level crossing. Present state: Extant in use as a private dwelling. Notes: Abermule station was situated on the Cambrian Railway (CR) main line that linked Aberystwyth and Whitchurch. 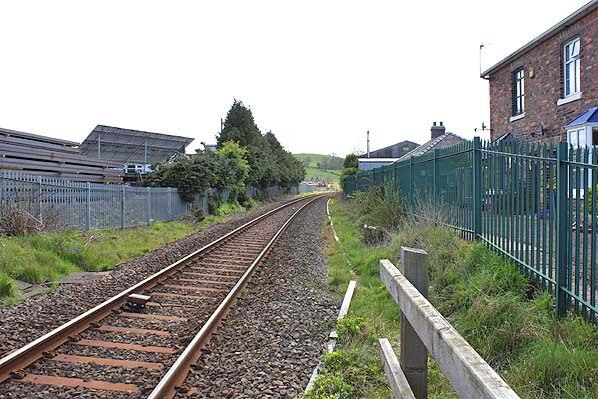 The section of line on which the station was located was opened between Newtown and Llanidloes by the Oswestry & Newtown Railway (O&NR) on 14 August 1860. They had previously opened a section of line between Oswestry and Pool Quay on 1 May 1860. At Newtown the O&NR had an end-on connection with the Llanidloes & Newtown Railway (L&N) which had opened to goods services on 30 April 1859. On 25 July 1864 the L&N and O&NR merged with the Oswestry, Ellesmere & Whitchurch Railway and the Newtown & Machynlleth Railway to form the CR (which also absorbed the Aberystwyth & Welch Coast Railway [sic] in 1865). The merger of the companies created the through route between Aberystwyth and Whitchurch. Abermule station opened on 14 August 1860 and was located to the east of the Newtown and Welshpool Road (the B4386) and to the south of the Kerry Road (the B4368). The CR main line was mostly single track but at Abermule there was a passing loop so the station had two platforms. Whilst Ellesmere, Oswestry, Welshpool and Llanidloes received unexpectedly large and architecturally memorable stations, at the minor roadside station of Abermule the buildings were decidedly modest. The main facilities were on the up platform (Whitchurch direction). They consisted of a single-storey timber building under a hipped roof with a recessed waiting area. Inside the building were a booking hall, ladies’ waiting room with WC, a lamp room and a luggage room. To the north-east of the station building, adjacent to the level crossing, were two railway houses. They were two-storey brick-built structures with pitched roofs, one of which had ground-floor canted bays abutting the platform. Towards the south-west end of the up platform there was a waiting shelter that included a gentlemen’s WC. On the down platform (Aberystwyth direction) there was a simple waiting shelter at the north-east end of the platform. Abermule station was also provided with goods facilities. A goods shed and sidings were located on the up side of the line south-west of the passenger facilities. The station opened as a temporary railhead terminus on 14 August 1860. Eastwards towards Welshpool the line was still under construction. 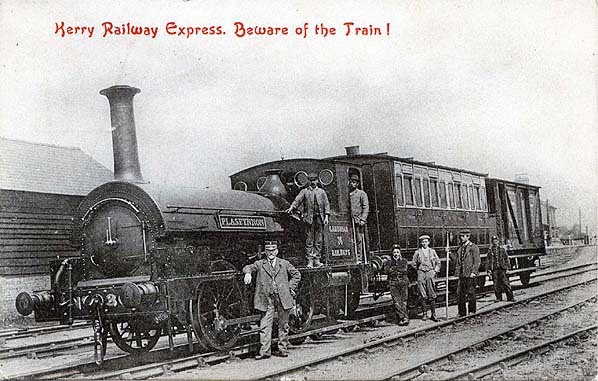 It was served by trains to and from Llanidloes via Newtown. The trains were operated primarily for the workmen who were engaged on the line’s construction towards Welshpool. The section between Abermule and Welshpool opened on 10 June 1861 and six trains were operated in each direction on weekdays running between Oswestry and Llanidloes. There were two trains in each direction on Sunday. With the opening of the line to Machynlleth on 3 January 1863 trains also started to serve that destination. The O&NR opened a branch from Abermule to Kerry in July 1863. It was provided with its own platform. The branch curved in from the south-east and ran to the rear of the down line platform and that was where the branch platform was located. 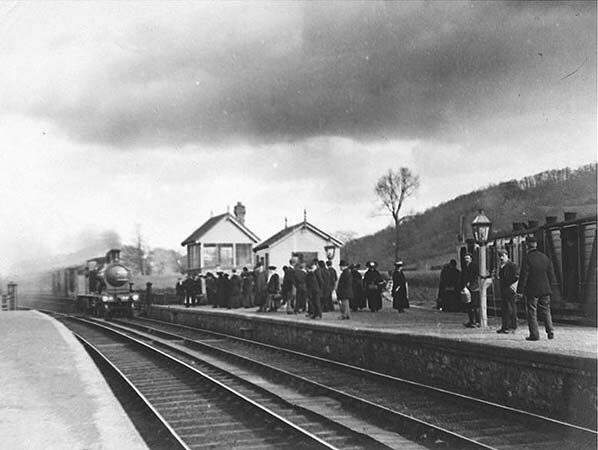 Kerry branch passenger trains commenced their journeys and terminated at Abermule. By 1864 the CR main line was complete and Abermule had up services to Oswestry and Whitchurch and down trains to Machynlleth and Llanidloes. Following the introduction of a Railway Act in 1879 the electric tablet system for single-line working was installed at Abermule. It was not installed in the signal box as might be expected. Instead an instrument room was created on the north-east side of the booking office and the equipment was installed there. The reason for the location was so that the stationmaster could observe the equipment and ensure its correct use. On the main line the December 1895 timetable showed four up trains on Monday-to-Saturday. There were four down trains Monday, Wednesday, Thursday, Friday and Saturday and six on Tuesday as shown in the table below. The timetable also showed three down and one up train making signal stops at Abermule Monday-to-Saturday. On Sunday there was one train in each direction. On the Kerry branch there were four trains in each direction on Tuesday-to-Friday and five on Monday and Saturday. In 1921 Abermule had a complement of five staff. 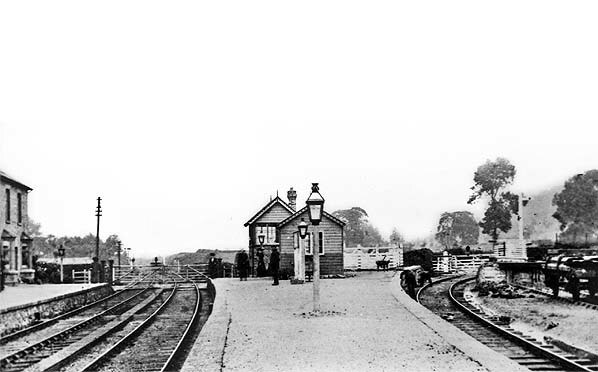 John Parry was stationmaster, William Thomas Jones aged 60 was one of the signalmen, Francis William Thompson was the 15-year-old booking clerk and Ernest Percy Rogers, aged 17, was the porter. Four staff would be on duty at any one time, the signalmen working in shifts to cover the period 3.00am until midnight. On 26 January 1921 at 12.06pm there was a head-on train crash at Abermule which resulted in 17 deaths and 36 serious injuries. The accident was directly attributable to the actions of the Abermule station staff. The single-track section of line between Abermule and Newtown was controlled by the electric tablet system and the instruments were located in the instrument room in the station building on the up platform. The points, signals and a ground frame at the south-west end of the station were controlled by the signal box which was at the north-east end of the down platform. In 1921 passenger trains were timed to pass each other at Abermule on two occasions on weekdays. The 10.26am up Express service from Aberystwyth to Whitchurch was timed to reach Abermule at 12.03 and the 10.05am down slow train from Whitchurch to Aberystwyth was timed to arrive at 11.57am. John Parry was absent on leave on 26 January 1921 and in his place was Frank Lewis performing the role of relief stationmaster. At 11.50am Francis Thompson (booking clerk) and Ernest Rogers (porter) were having lunch in the station booking office. Thomas Jones (signalman) was in the adjacent instrument room and Frank Lewis (relief stationmaster) was away at lunch. At 11.52am a bell signal was sent from Montogomery signal box for the down slow train from Whitchurch. Thomas Jones accepted the train and pressed a button that released a tablet from the instrument at Montgomery so that it could proceed to Abermule. The train was booked as entering the Abermule section by Jones at 11.55am. He then telephoned Moat Lane Junction to enquire about the whereabouts of the up express and was told that it had just passed. Jones then told Rogers that the slow train had left Montgomery and that the express had passed Moat Lane Junction and he left the booking office and went to the level crossing. He closed the gates to road traffic and then went into the signal box where he lowered the down line home signal for the slow train. At 11.56am a bell signal came through from Newtown in relation to the up express. Rogers went into the instrument room, acknowledged the bell and plunged on the Newtown – Abermule instrument to release a tablet at Newtown so that the express could proceed to Abermule. Ernest Rogers should not have performed this task as he was not authorised to do so. Only signalmen or the stationmaster were authorised to operate the electric tablet system. However it had become common practice for all of the staff at the station to operate the equipment. Rogers did not tell Lewis or Jones what he had done. He set off for the ground frame that was located at the south-west end of the station so that he could operate the points there. The down train from Whitchurch arrived at 12.02pm and Jones reset the down line home signal to danger. He then left the signal box and went onto the down platform. Francis Thompson, who was standing on the up platform, jumped down onto the track and walked to the engine. He took the Montgomery – Abermule tablet which was contained in a tablet holder (a bag with metal hoop) from the engine crew and went back onto the up platform with the intention of placing it back into the instrument and drawing out a Abermule – Newtown tablet. Thompson was also not authorised to perform these tasks but, like Rogers, he regularly did. Had he made it to the instrument room he would have discovered that a tablet could not be released because the express had already been given a tablet for that section of the line. However he met Frank Lewis on the platform and said, ‘Change this tablet Frank and I will go and get the tickets’. Lewis had gone for lunch early and when he returned to the station he went to the goods yard with a member of the permanent way staff to discuss a wagon that was there. When he returned to the platform and was handed the tablet holder by Thompson he assumed it was for the Abermule – Newtown section and was to be given to the engine crew. He believed that Thompson had told him the slow train was ‘going on’. He assumed the tablets had been changed under the authority of the signalman. He asked Thompson, ‘Where is the express?’ and received the reply ‘about Moat Lane’. This made Lewis think that the express was running late and he knew that it did not take long for a train to reach Newtown so to him it made sense to send the down slow train on to that station where the pass could be made without delaying it. He told Thompson to go to signalman Jones and tell him to pull the signal off for the down train. Thompson then crossed to the down platform and collected a ticket from the one passenger who alighted from the train before relaying the message to Jones. Lewis went over to the engine and handed the tablet holder to the locomotive crew. The driver did not check the tablet which he was supposed to do. Had he done so he would have seen the error and the train would not have departed. When Ernest Rogers arrived at the ground frame at about 12.00 he found that the points were set for the down loop. The express would pass along the up loop through the up platform so he attempted to reset the points but was unable to do so. He hesitated for a moment and then walked onto the up line to shout to the signalman. He saw the down passenger train and the stationmaster signalling with his arm for it to depart. He assumed that something had changed and that the up express had been stopped at Newtown. Because he had seen the stationmaster signal for the slow train to depart he thought everything must be all right. The down slow train departed at 12.03pm. Newtown station sent a bell signal to Abermule to say that the express had left at 11.59am but there was nobody in the station building to hear it. When Francis Thompson returned to the instrument room to give the bell signal to Newtown for the down slow train he saw that the indicator showed that a tablet had been given for an up train and not for the down slow service. Lewis who was also present realised what he had done and he phoned Newtown to see if the express could be stopped. It had already left. A vain attempt was made to stop the down train by raising the up distant signal but it was too late. The up express and the down slow train collided head-on one mile to the south-west of Abermule station. The driver and fireman of the slow train were killed and the driver and fireman of the express were seriously injured. The accident report of 8 April 1921 by J W Pringle criticised the lax way in which the company’s rules were followed by station staff and in the case of this accident by the engine crew of the down slow train. It stated that Thompson and Rogers were ‘well-meaning lads’ but they should never have been allowed to use the electric tablet system. One of the recommendations was that where possible token systems should be located in the signal box and not separate from it. Due to coal shortages an emergency timetable was introduced on 5 May 1921 which saw the Kerry branch service reduced to Tuesday-only. On 1 January 1922 the CR was absorbed into the Great Western Railway (GWR). The July 1922 timetable showed six up and four down trains on the main line. There was only one train to Kerry on Monday, Tuesday, Thursday and Friday. On Wednesday and Saturday there were two. On 9 July 1923 the GWR opened halts on the Kerry branch at Ffronfraith and Goitre. They increased the service to seven trains in each direction but it did not produce the returns that had been expected and by the end of the decade there were only a couple of trains each way on weekdays. On 9 February 1931 the Kerry branch passenger service was withdrawn. On 1 January 1948 Abermule became part of British Railways [Western Region] (BR[WR]). The summer timetable for 1949 showed seven up and five down services on Monday-to-Saturday. There were two up trains to Shrewsbury, two to Whitchurch, one to Wolverhampton Low Level, one to Welshpool and one to Oswestry. Four of the down trains went to Aberystwyth and one to Llanidloes. On Sunday Abermule had one up train to Whitchurch one down to Aberystwyth. On 1 May 1956 the Kerry branch, which had continued to be used by goods services, was closed completely. At Abermule station a short section of the branch remained in situ as sidings. The 15 September 1958 timetable showed six up and five down trains on Monday-to-Friday. There was an additional down train that set down only by request. On Saturday there was an extra down service and there was one train in each direction on Sunday. On 1 January 1963 Abermule passed to the operational control of British Railways [London Midland Region] (BR[LMR]). Three months later the Reshaping of British Railways report (the ‘Beeching Report’) was published. What was, by then, the main through route from Shrewsbury to Aberystwyth was to be retained for passenger traffic, but with only Welshpool, Newtown, Machynlleth and Dovey Junction stations to remain open. Curiously, the Dovey Junction to Pwllheli line was to be left unscathed. Abermule’s goods services were withdrawn on 4 May 1964. On 15 May 1964 the intention to close the intermediate stations named by Beeching, including Abermule, was published. On 29 December 1964 the Minister of Transport, Thomas Fraser, announced that all of these stations, bar one, would close; only Caersws was saved, was notionally the railhead for Llanidloes. 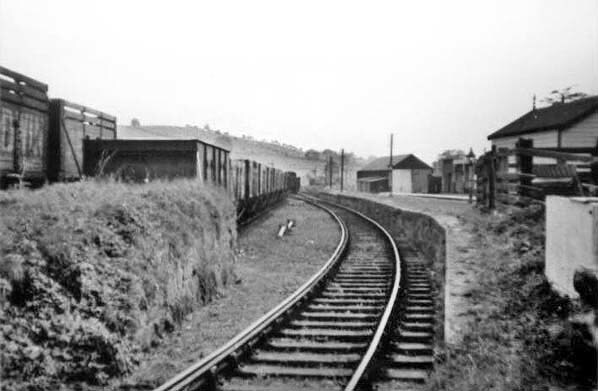 BR[LMR] closed Abermule and the other minor Shrewsbury – Aberystwyth stations on 14 June 1965. 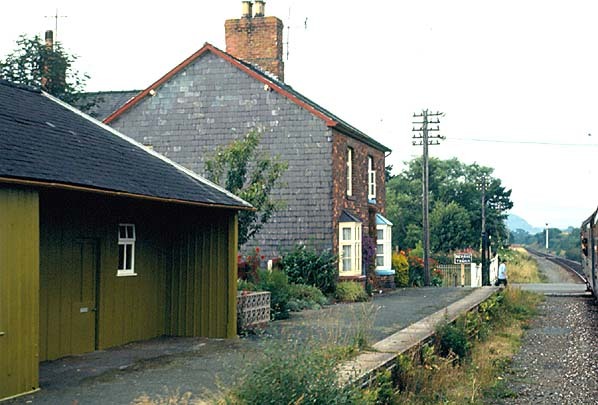 The station platforms and buildings survived until the 1970s. Historic Railway Disasters - O S Nock - Ian Allan 1992. Abermule station looking north-east from the up platform in 1904. A down train is seen approaching and a large number of passengers are waiting to board. To the right a Kerry train can be seen waiting to depart in the branch platform. Abermule station shown on a six-inch scale map from 1901. The 'Kerry Express' was the name that was bestowed upon the Abermule and kerry branch passenger service. It is seen in this view from the early 1900s looking north-east at Abermule station. The station platforms can be seen to the right behind the train and the goods shed can be seen to the left. Abermule station looking north-east along the down platform in the early part of the 20th century. The Cambrian main line is seen to the left and the Kerry branch to the right. The Kerry branch platform at abermule looking south-west in 1948. 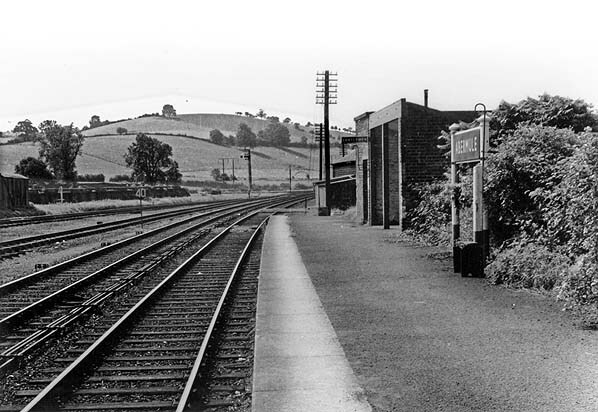 Looking south-west along the Abermule station up platform in 1963. 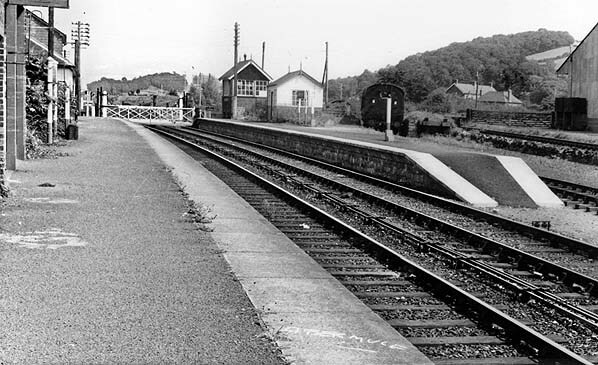 Abermule station looking north-east along the up platform in 1963. The Abermule up platform seen from a passing train on 1 August 1973. The platform had been little altered since the closure of the station eight years previously but the former up line had been removed leaving only a single track passing through the station. Looking south-west at the site of Abermule station on 3 May 2016.